Link to my new Class Blog! Yipee, tomorrow is the last day of the school year. My little guys are going to meet their new teachers tomorrow and visit their Year 2 classroom. It's been a great year with lots of fun activities and new learning. The brainy bunch have worked really hard and deserve a great holiday. Hope Santa visits them this Christmas and may peace, love and joy be their gifts. To all their wonderful parents, thanks for all your support, encouragement and offers of help. We could not have done it without you. Thanks to all our readers and visitors. I will have a new class and hence a new class blog. We resume school on Feb 2, but the blog will be set up later on in the year. Please do visit us, it encourages little minds to do better. 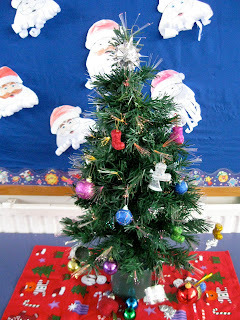 Merry Christmas and a Great Year ahead 2010, from the Brainy Bunch. Christmas is fun because we get lots of presents. We get to sleep over. It is fun. We get to open our presents. My family will have dinner at oma and opa’s. We get to get our friends over. At oma’s we open our presents. I want a pony and some pets. Oma has a fairy on her Christmas tree. She has lots of decorations. We will have dinner together. Yesterday we made gingerbread man with ginger, flour, sugar, egg, butter. We put lollies and smiles on. Then we put it in the oven. Our smiles melted because they were jelly snakes. When we ate them they were yummy. I loved the chocolate M and M the best. We had a visit from Craig Smith who is a very clever story writer of children's books. He makes a tune to his stories too. We felt really special that he visited our school to share his books with us. The Wonky Donkey is a must read book and comes with a CD too. The author has a beautiful voice. Here are some of our stories. My little darlings in Room 3 you are all winners in my eyes. You work really hard, try your best in everything and I love that you guys have come such a long way. You have all achieved a lot and I hope you have gained skills that you will use later on in life. You are my PRIDE and my JOY!!!!!! Sorry about the font, we tried a new thing using I-photos which was making a book. Thanks to everyone that voted for our class blog. The voting has closed. We will know the results at the end of the month. We hope we get 1st place. Please keep visiting us and leave comments. This is what we do at Number 3 EP School. Just received an email telling me that our blog is one of the 5 finalists in this year's INTERFACE Awards 2009 'Best Class Blog'. What an achievement Room 3! The Interface Magazine is the technology magazine for educators to learn about using ICT. The judges have chosen the top 5 blogs and now it is for teachers and educators in NZ to decide who the winner is. Kindly click here to vote for Room 3's Blog The Brainy Bunch @ Elm Park School. Voting closes 5pm Monday 19 October, 2009. Everyone who votes goes into a draw to win a 16GB Toshiba USB Thumb Drive. What will a safe place be for Mrs. A's wallet????? View more presentations from veronicaa. View more documents from veronicaa. Today was Jump-rope for the Heart Day. Here is a slide show of the fun we had. MA thought it was 100% fun. Some of us thought using skipping ropes was the best thing in the whole wide world. We also had some lovely parents come and watch us. Thanks to Mr. B for taking the fantastic photos of us in action. Mrs. A would like a lesson in photography from you! MA and ED used a story board to retell their Reading Book. There drew their pictures in Kid-pix and made a slide show. They then exported it as a Quicktime. Please do leave comments for them as this work was done entirely by themselves. Great job boys! A Blog With a Purpose!!!! It has been great to share our work with our family. We have found the blog to be a useful tool. Please read to know why. Some of our parents tell you why they think having a class blog is worthwhile. Kindly click on 'full' to view full screen. This is my amazing class of 2009. 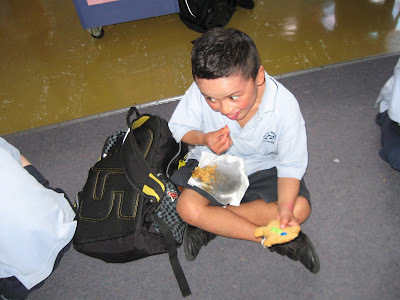 We are a Year 1 class in Auckland (NZ). Please come in and share in our learning. Leave comments and ask questions. We'd love to hear from you!